Although almost every democratic country suffers from bloated government, over-regulation, heavy taxation and enormous public debts, few people see a causal connection between these problems and the democratic system itself. For many, the solution to these problems is more democracy, not less. Democracy tends to be equated by many people with prosperity, equality, fairness, togetherness and liberty. There is no evidence for any of this. Democracy rests on three main principles: you have the right to vote, you have the right to run for office, and the majority rules. That’s it. Nowhere is it written for instance that democracy guarantees the right to free speech, a right that many people link with democracy. Nor is there any reason why democracy should lead to prosperity. In fact, the very principles of democracy give rise to processes that lead society to the opposite of freedom and prosperity. The most important of these processes are the following. As Hans-Hermann Hoppe explained in his 2001 book Democracy, The God That Failed, democracy leads to high time preference, both among rulers and citizens. Since democratically elected politicians are only temporarily in office, and since they are not the owners of the resources at their disposal, they have a strong incentive to spend money on projects that make them popular, with little regard for the future. The problems they create along the way, such as massive public debts, they leave for their successors to solve. A democratic society is like a rental car – or worse: a car that is owned by no one and used by everyone. It is quickly run down. Democracy is a system in which people vote for politicians whom they hope will favor them with handouts and privileges, for which the bill will be sent to other people. It sets groups up against each other: farmers versus urban dwellers, the elderly versus the young, immigrants versus residents, employers versus employees, etc. This leads to parasitical behavior and social strife. This is the result of the democratic principle that all important decisions are subject to majority rule, i.e. rule by the State, which makes everyone a cog in the collective political system. In a free society, based on individual rights, people with different views and goals do not become each other’s potential enemies. They may cooperate with each other, trade with each other, or leave each other alone – but they have no coercive means to use others for their own ends. Although many people associate democracy with freedom, in reality no liberty is safe from democracy. If the majority (or often some small influential group) wants it, they can intervene into any kind of voluntary action, transaction or relationship – and that’s what they do. They forbid people to drink booze, burn flags, speak out against wars, watch particular movies, ‘discriminate’, and so on. Democratic governments continually intervene in voluntary transactions between sellers and buyers, employers and employees, teachers and students, doctors and patients, renters and landlords, service providers and customers, et cetera. They also meddle in people’s personal choices: their choice to smoke, to use drugs, to engage in a particular profession (without a ‘license’), to ‘discriminate’ (i.e. to choose with whom they want to associate), to make particular products (for which others have been granted a ‘patent’, i.e. a government monopoly), et cetera. There is no limit to how far this meddling can go. The little freedom we still have in western societies we owe not to democracy, but to our freedom loving heritage. In pre-democratic times rulers tended to be distrusted and every new tax was seen as an infringement of liberty. But democratic decisions are seen as fundamentally legitimate because they are supposed to have been made by the people themselves. In monarchical times few could ever hope to gain power, so most were suspicious of the ones in power. But democracy leaves, at least in theory, the door open for everyone to gain power. This makes people believe that they ought to subject themselves to the rule of the majority. They might not agree with specific laws and regulations but they feel they ought to abide by them. But naturally they then will try to get a party in power that adopts laws and doles out money for their own benefit. 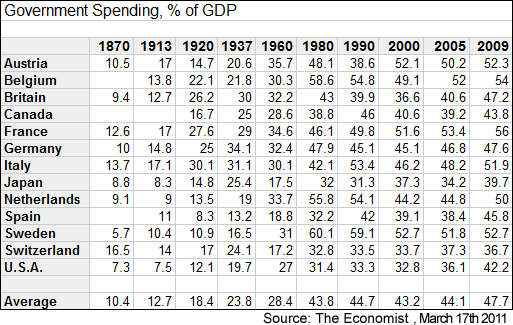 This is how state spending grew from roughly 10% of GDP prior to the First World War to almost 50% now in most democratic countries. And why we have so many laws on the books now that it’s safe to say there is a law for everything under the sun. Although rule by the majority is bad enough in itself, the reality of a democracy is much more sordid. Since the elected government has virtually unlimited power and controls virtually all of society’s resources, all sorts of interests and lobby groups are at work behind the scenes to influence government to bend laws to their advantage. One obvious example are the banks and financial interests that together with the government have set up a paper money system which they control and manipulate to their own advantage. But there are many powerful interests that use the system at the expense of the rest of the people: labor unions, NGO’s, pharmaceutical companies, farmers, the military-industrial complex. Individual citizens can do very little about this. They usually don’t have the means or the time to find out what is going on. All they can do is vote every once in a while, but they cannot hold their rulers accountable for their actions. So the cause of our economic and social ills is not that the wrong politicians are in power. It’s the democratic system itself that causes the problems. What we need to do is start changing the system so it becomes less rather than more democratic. The most important way to do this is by taking away the government’s powers and decentralizing decision-making processes.